The main office of the Deerwood Bank in Deerwood was robbed at about 9:00am Saturday morning. According to the Crow Wing County Sheriff's Department a man walked into the bank and handed a note to a teller demanding money. The teller complied with his demands and the suspect left with an undisclosed amount of money. The suspect did not display a weapon or threaten to use a weapon and calmly left the bank. A vehicle description and direction of travel were unknown. The suspect is described as an adult male, 5'5'' to 5'8'' inches tall, weighing about 160-170 pounds, wearing red ball type cap with unknown graphics. The suspect was also wearing a long sleeve shirt with Boston Red Sox graphics and blue warm-up pants with a stripe on the side. He had a soft cast or wrap on this left hand. The Crow Wing County Sheriff's Office is asking for help from the public in indentifying the suspect. Anyone with information is asked to call 218-829-4749. Also involved in the investigation is the Deerwood Police Department, Crosby Police Department, The Aitkin Police Department and the Minnesota State Patrol. BAXTER, Minn. – The Minnesota Department of Transportation and the city of Baxter are partnering to construct a $1.2 million road and safety improvement project on Highway 210 in Baxter that begins Monday, June 28. Access improvements will be constructed at the intersection of Highway 210 and the new city street to be named Timberwood Drive just east of the Cass County line. Work includes a new left turn lane and overhead intersection lighting on Highway 210 and completing construction of Timberwood Drive. Motorists may encounter periodic lane/shoulder closures with flaggers controlling traffic. Starting July 12, crews will resurface the Highway 210 mainline, including turn lanes, from Cass County line to Golf Course Road in Baxter. Motorists may encounter lane closures/shifts and flaggers controlling traffic at accesses. Motorists are asked to slow down, watch for crews working and heavy moving equipment. For updated statewide traffic, construction, weather and travel information visit www.511mn.org. Dale Robert Caruso age 64, formerly of Brainerd, passed away at his home in Lynchburg, VA on June 18th. Caruso was program director of KLKS-FM for a six year period in the early 1990's and won several awards for documentaries he produced while at the station. Memorial Services and Interment will be 11:00am on Tuesday, June 29th at Minnesota State Veterans Cemetery near Camp Ripley. Arrangements are with the Brenny Funeral Home of Brainerd. The number of structures damaged by the June 17th Wadena tornado is expected to hit 268, according to city spokesperson Judy Jacobs. She tells KLKS News, the Community Center is Gone, the fairgrounds has be decimated and it's not known if the high school can be repaired. Jacobs says 2000 dump trucks full of debris has been taken to the old airport site for temporary storage. The city still needs volunteers to help with the clean-up. All volunteers are asked to register with the city first. The number to call is 1-800-543-7709 or 211. The Breezy Point-Pequot Lakes Stars & Stripes Days Committee along with the event’s Gold Sponsor, Dotty Brothers Construction, is always striving to make each year’s events more successful and enjoyable. Several noticeable new changes have been made this year in regards to parking and access to the parade route. Most importantly, the parade start time on July 4 will be at 1 p.m. This is due to the 4th being on a Sunday and the committee would like to be respectful to those citizens that wish to attend church. Parade entries need to stage in the Industrial Park from 11 a.m. – 12 p.m. In an attempt to ease the congestion on County Road 11, free shuttle bus service will be available 10:30 a.m. – 3:30 p.m. to the City Hall from Eagle View Elementary School on July 4. Park in the school parking lot and ride the shuttle for free! Chris Greer is offering parking on his lot adjacent to County Road 112. Cost is $3 per car. Parking is also available at the Pequot Lakes High School and TDS Telecom. The Parade route is only a few blocks away by crossing at the stop lights. Marked handicap parking is available on Government Drive west of Market Place, East Butler Street, and Old Hwy 371 in front of Pequot Lakes Dental. Parade spectators need to stay behind the marked parade line, so floats have enough space to maneuver corners. Parents are urged to watch their children and not allow them to run out into the street during the parade. The committee urges everyone to arrive early and take part in all of the festivities on July 4, such as: the Fireman’s Pancake Breakfast (7-11 a.m.), Kiddie Parade (10 a.m.), Youth Karaoke Contest (9:30 a.m.), Flea Market (9 a.m.-4 p.m.), Moon Jumps (10 a.m.-4 p.m.), and Money in the Haystack (10 a.m.). Don’t rush off just because the parade has gone by you, events will continue after the parade. Come back to the band shelter for the Adult and Group Karaoke Contest (2:30-4:00 p.m.). The popular Bed races will be held in the Chamber Parking Lot (3 p.m.). Roads will remain open to allow access to Pequot Lakes until 12: 30 p.m. County Road 112, County Road 11, and Old Hwy 371 will remain closed throughout the duration of the parade. The Pequot Lakes Police Department is not allowing parking along the parade route. Vehicles will be ticketed and towed. Saturday, July 3 events will include the Fireman’s Rodeo (6:30 p.m.), S.T.A.R.T. Band (7:30 p.m.), Moon Jumps (6:30-10:00 p.m.), Carnival Games (6:30 p.m.), Pony Rides (6:30 p.m.) Food Vendors (5 – 10 p.m.) and Fireworks (dusk). Donation cans have been placed in Breezy Point and Pequot Lakes businesses. Your leftover change adds up to a generous amount, so please drop your change in the fireworks cans to help fund all of these activities. The Mayor of Wadena says they have made good progress in the clean-up effort following the devastating tornado that crushed the town last week. Still, Wayne Wolden says, "We're still a disaster state." The twister destroyed 262 structures and 25 homes. Governor Tim Pawlenty was in town yesterday, and may make another stop today. He has requested federal financial help. The Governor wrote to President Obama seeking a major disaster declaration for several counties, including Wadena. In his letter he said the disaster "Is of such severity and magnitude that effective response is beyond the capabilities of the state and local governments." Old cars and music will fill the grounds at Billy's restaurant in Breezy Point Sunday. It's billed as, "Crusin' for the cause and pledgin' for the PAWS." Tami, of the singing duo, Tami and the Bachelor, says they want to raise money for the organization PAWS. She says the non profit cares for abandoned and displaced animals, including those from the recent Wadena tornado. The event will be held at Billy's in Breezy Point from 3 to 8 p.m. Sunday. For more information call (218) 639-7297. Lakes Area Artists will hold their 13th annual Show & Sale through Saturdayat the Nisswa Community Center. Visitors will find hundreds of original works in oils, acrylics, watercolors, Asian Brush Painting, monotypes and nature prints and photographs. Diane Runberg says there will be demonstrations each day. Demonstrations and sales will run from 10:00am - 5:00pm each day. Pine River Summerfest runs through Sunday. Chamber President John Wetrosky says there is lots to enjoy, including arts/crafts displays, duck races, fireman's street dance, Lions Fly-In/Drive-In Pancake Breakfast, softball tournament, golf tournament, Fun Run/Walk, Legion steak fry, sidewalk sales, food fair and of course the Saturday parade. The parade kicks-off at 2 p.m. this year instead of 1 p.m.
Wetrosky is anticipating over 40 units in the parade. Events begin at 9 a.m. each day and continue throughout the day. Lions Fly-In/Drive-In is from 7:30 a.m. to noon Sunday. The Cass County Sheriff will be ramping up for another round of Safe and Sober enforcement next year. Chief Deputy Tom Burch says the county has been notified it has won another $20,000 grant. The funds will be used to pay for active enforcement of impaired, seat belt, speed and aggressive driving violations. Deputy Burch says the reduction of fatal accidents in the county can be attributed to the campaign. Brainerd DNR Non-Game Specialist Pam Perry has been gathering data on plants and animals that inhabit lakes in Cass County. 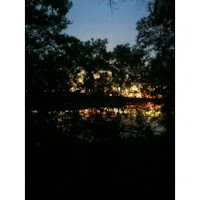 Now, she is moving into Crow Wing County to conduct the Sensitive Shoreline Assessment Project. She tells KLKS News, she will be focusing attention on Pelican Lake and the Whitefish Chain. Once compiled, the information will help local units of government and area lake associations develop restoration plans. Perry says she has cataloged more than 70 species of birds that live along the shores of Pelican Lake. The Initiative Foundation, based in Little Falls, Minnesota today announced a partnership with the city of Wadena and Mid-Central Federal Savings Bank to accept donations and administer the online Wadena Tornado Relief Fund. 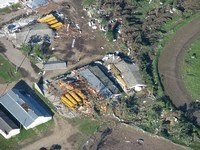 The Initiative Foundation and West Central Initiative will match the first $12,500 in online donations at www.givemn.org Donors should click on the “Wadena Tornado Relief Fund” link to make a donation. GiveMN.org is a Minnesota-based nonprofit giving portal. One hundred percent of the tax deductible donations will go to the city of Wadena to meet the needs of the affected families and help with volunteer and clean-up efforts. Former Senator Carrie Ruud is hosting a Meet and Greet Fundraiser for Republican State Senate candidate Paul Gazelka on Thursday, from 5 – 7 pm at the Nisswa American Legion. Hors d’oeuvres will be served and a silent auction featuring unique choices will be held. There is a $15 entrance fee to help defray expenses. Gazelka, a former State Representative, is challenging Senator Paul Koering in the Republican Primary in August. The city of Wadena, devastated by a tornado on June 17, is calling for volunteers through Saturday. A maximum of 350 volunteers each day is required to perform the clean-up work. Those wishing to provide assistance are asked to register by calling either 1-800-543-7709 or 211. This is an automated system. Please stay on the line and speak with an attendant for additional details. Volunteers should wear sturdy shoes or boots, gloves, long pants and shirts and should bring shovels and garbage bags. Groups of 15 or more are asked to pre-register with 211 and identify the date and time available, number of people in the group and provide the name of the group leader. Volunteers should report to the old Pamida on Highway 71 north from 8:30 a.m. until 6:30 p.m. and to check in before starting service. The city of Wadena will observe a community-wide day of rest on Sunday, June 27 to allow residents to re-assess their situations. Residents of the city wish to thank the public for their overwhelming show of support, caring and compassion during this difficult time. (AP) A Fifty Lakes man will be able to keep a bear carcass after all. R. James Swenson found the expired bruin on his farm in 2007. He brought it in to the taxidermist, and asked his lawyer to inform the DNR. The DNR confiscated the animal, and issued a warning. City officials are asking volunteers to stay out of the storm damaged area until volunteer efforts are announced later this week. Individuals or organizations interested in developing fundraisers or benefits to assist the victims should contact Judy Jacobs, 218-232-6753. (AP) The tornado that ripped through Wadena Thursday was packing 170 mile per hour winds, according to the National Weather Service. Storm cut a path a mile wide and 10 miles long. There was a similar story of distruction through the Amora-Bluffton area. The weather service is checking other tornado reports. A funnel cloud was reported over Pelican Lake near Breezy Point. However, it never made ground contact. 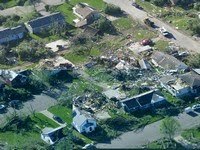 Three people died in Minnesota from the string of twisters. The Summer Solstice arrived at 6:28 a.m. this morning. The predawn morning was a blaze red as the result of some showers and thunderstorms to the south and west. K-Lakes Meteorologist Tony Schumacher says this should be a normal summer, maybe a little on the sticky side. Schumacher says air conditioners should get a lot of exercise. And, with all the humidity, thunderstorms are likely.